We made it! Despite supposed Mayan prophecies and election-day doomsaying, the already-sort-of-tumultuous 2013 is here, with the very tumultuous 2012 fading quickly in the rearview mirror. Want to join the million or so revelers ringing in the new year in Times Square? The video of the first seconds of the year below. For Times Square 2013, 288 of the Waterford Crystal triangles introduce the new Let There Be Peace design of a dove with wings spread symbolizing a message of peace; 288 triangles feature the Let There Be Friendship engraving of people holding hands around the world; 288 triangles are emblazoned with the romantic Let There Be Love pattern of a cascade of hearts; 288 triangles showcase the Let There Be Courage ribbon medal design; 576 triangles sparkle with the Let There Be Joy design of an angel with arms uplifted welcoming the New Year; and the remaining 960 crystal triangles are the Let There Be Light design of a stylized radiating sunburst. The Ball is illuminated by 32,256 Philips Luxeon Rebel LEDs (light emitting diodes). Each LED module contains 48 Philips Luxeon Rebel LEDs – 12 red, 12 blue, 12 green, and 12 white for a total of 8,064 of each color. 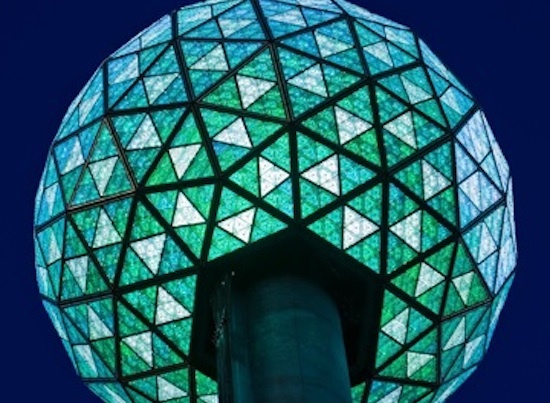 The Ball is capable of creating a palette of more than 16 million vibrant colors and billions of patterns producing a spectacular kaleidoscope effect atop One Times Square.